In less than two weeks, millions of Americans will resolve to improve themselves in some way in honor of the New Year. Some people will pledge to lose weight or exercise more. Others want to quit smoking or make better financial decisions. 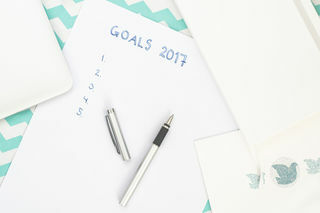 While New Year’s resolutions are popular – about 40 percent of people make them, according to one source – few people actually succeed at keeping their resolutions. In a series of studies, researchers from the University of Scranton followed 200 people who made New Year’s resolutions over a two-year period. Seventy-seven percent were able to keep their resolutions for one week. At a month, 64 percent reported success. That fell to 50 percent after three months and 46 percent after six months. Only 19 percent deemed themselves successful in reaching their goal when researchers followed up two years later. While that might not seem like a good success rate, the study found that people who made resolutions were 10 times more likely to make a positive change after six months compared to people who wanted to change but did not make a New Year’s resolution. So there is some evidence that making a resolution is worthwhile. Now how to make it stick? Beyond tracking success, the researchers were able to draw some conclusions about why some people are successful at keeping resolutions, while others aren’t. There were some factors that didn’t matter, including age, gender and the type of resolution made. People who were successful used strategies that are proven effective in a variety of behavior change research. This includes stimulus control, or avoiding tempting situations. So if you’re trying to lose weight, skip the cookie-baking party. And if you are trying to quit smoking, don’t go to the bar where your friends are chain-smoking. Researchers also found evidence that rewards help. So if your goal is to lose weight, pledge to buy yourself a new piece of clothing when you hit the 10-pound mark. The most important factor in predicting success was self-efficacy – the belief in one’s ability to get the job done. That likely means that you have spent some time thinking about and planning how to achieve your resolution, and also whether your resolution is realistic. Losing 50 or 75 pounds is admirable, but keeping 20 pounds off for a year is probably a better place to start. In one of the most recent studies, the findings showed that people really slipped quite a lot. That is, most successful resolvers slipped in January. But they discovered that a slip, a momentary lapse in the resolution, need not be a complete fall. They picked themselves up and recommitted themselves to the resolution after a slip. The take-home message: Making a New Year’s resolution is useful exercise and – with the proper planning and attitude – is an effective way to make a change in your life.